ANNOUNCER: Heading to where the food is in Lakewood, Dutch and Jackie find themselves on South Tacoma Way. And surprisingly the cuisine of choice is not Asian influenced, but rather a small but authentic Mexican spot -- Mi Casa. 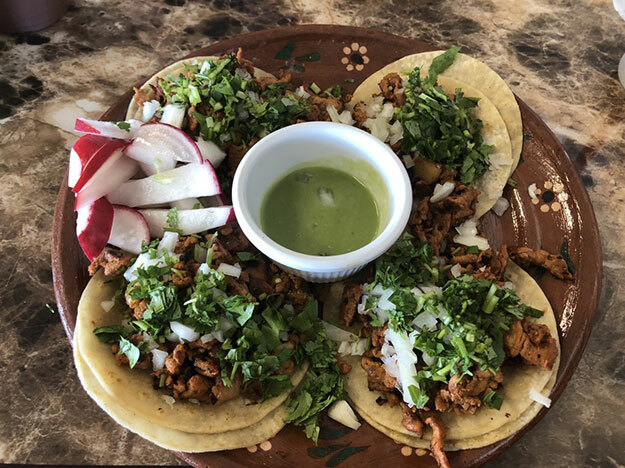 JACKIE: If South Tacoma Way can boast of anything, it would be the most strip mall foodie gems that can be found within the same stretch of pavement. Mi Casa Mexican is another of these fabulous finds. When you walk into a Mexican restaurant and you're the only guests not speaking Spanish, it's a good indication that you're in for the real deal. DUTCH: It did not go unnoticed that I was an uncommon diner, as an older woman rushed to my side to guide me through what she believed I would like best. Instead, however, I asked what she was having, because, hey, if I'm going to get good authentic Mexican food, I'm going to grab what the locals are grubbing on. I decided on the Platter Ranchero that consisted of both chicken enchiladas and a carne asada. The steak was flavorful and tender while the enchiladas were tender with a bit of a kick once I added the house salsa. Additionally, the plate came with rice and beans that were fresh and light as if they had been made fresh just for me. As if that were enough, the dish also comes with grilled cactus, onions and a jalapeno pepper -- all of which added more to the dish than decoration. JACKIE: Tacos Al Pastor are so simple but this dish is the gold standard. The meat is super flavorful and tender and is dressed simply with loads of cilantro and raw onion. The filling-to-tortilla ratio is generous, so get your fork ready to scoop up all the remaining goodies that have fallen to your plate. The avocado crema is a delightful touch and the hot sauce brought to the table in a squeezy bottle teases with a whisper of spice and smoke. DUTCH: I went full spicy taco and feasted on the Tacos Al Vapor. These are not your household tacos; the corn tortillas are soaked in red sauce before stuffing them with plenty of shredded chicken and garnishing them with fresh lettuce and lots of crumbled cheese. Though a fork was needed to get through them, these will really hit the spot if you're accustomed to Mexican street food and want something a little more authentic than can normally be found. JACKIE: The Chilaquiles comes as a mountain of thick, crisp chips layered evenly with ooey-gooey cheese, tender bits of your choice of meat (in this case chicken), cilantro and jalapeño all dressed with ample verde sauce, a sprinkle of cotija and a drizzle of crema. The chips stand the test of time as the foundation; they remain crunchy and capable of scooping enough of each component to get the perfect bite each time. This dish will have me coming back again and again. DUTCH: All that good eating and you didn't grab a fried plantain for dessert? C'mon Jackie -- you're slipping. A deep-fried plantain, which is less sweet than a banana, is garnished with a little chocolate syrup and some whipped cream. A nice clean finish to a spicy meal.